Looking for places to promote your business online? Online marketing has changed so much in the past few years that some of the basic practices of promotions are nothing more than spamming in 2015. Article marketing and directory submissions are two practice that are not even mentioned any more. However, it is not about SEO always. Conversion is the bigger issue. Take your business to places where your customers are and enjoy the after effects. Update: Here’s a new one – Amplify Blog. Do Join in. Here, in this article, we will cover 10 of the most popular social bookmarking websites. Kingged ( http://kingged.com/ ) @kinggedcom has been gaining steady recognition from online marketers as the central hub for the marketers to hang out. There are many benefits of staying active on Kingged as they pay for activity and engagement. They pay for things like making comments on a daily basis. Kingged is an active community and a submitted blog post is well received by their members. Surely a great place to stay active. TSU ( https://www.tsu.co/uttoransen ) There is no good time to join a new social network. You just need to kick yourself and get started. Join now and reserve your Username before someone else does. Tsu is very new but they have built up an initial base to work on. 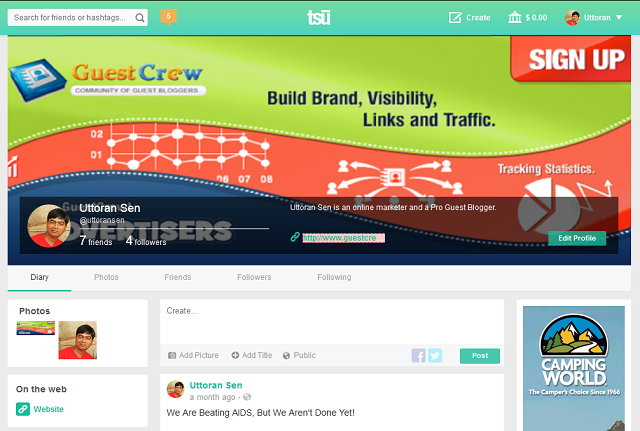 Marketers and bloggers have started catching up on Tsu already and is actively sharing their posts and getting engagement. Biz Sugar ( http://www.bizsugar.com/ ) @smallbiztrends is the ultimate destination to discuss and learn small business tips and news. 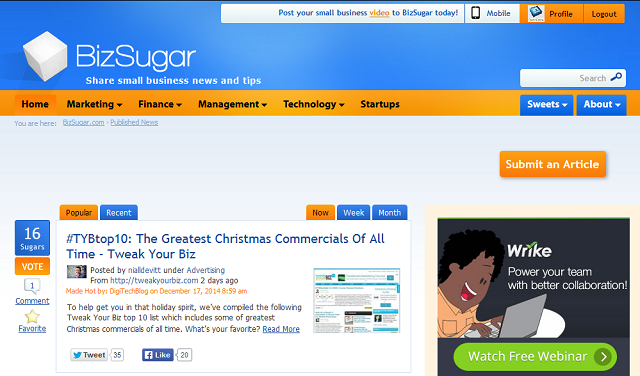 It is easy to reach the biz sugar homepage for a submitted story if you are active on the website. Most stories that reaches the homepage not only get a lot of traffic but they also gain visibility among the online business class. This results in mentions, features and links. BlogEngage ( http://blogengage.com/ ) @bbrian017 is one of the oldest social bookmarking site in the list. 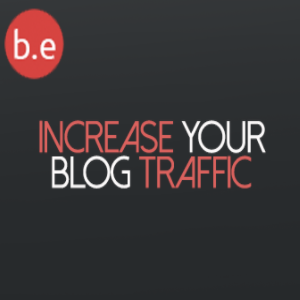 BlogEngage has paid subscription plans that allows auto submission and auto-promote to the homepage of blogengage depending on the plan you have purchased. Klinkk ( http://klinkk.com/ ) is an active social bookmarking community, owned and managed by @ErikEmanuelli Erik. There are many social bookmarking sites but most aren’t managed properly. So, if you are looking for a community that is managed and is active, then klinkk surely holds a top spot. Blokube ( http://www.blokube.com/ ) Brian of Blogengage has recently taken over Blokube and given it a new look. It was old, active, popular and established. Now it is also Fresh and Cool! Growth Hacker ( https://growthhackers.com/ ) @GrowthHackers is a new find for me. 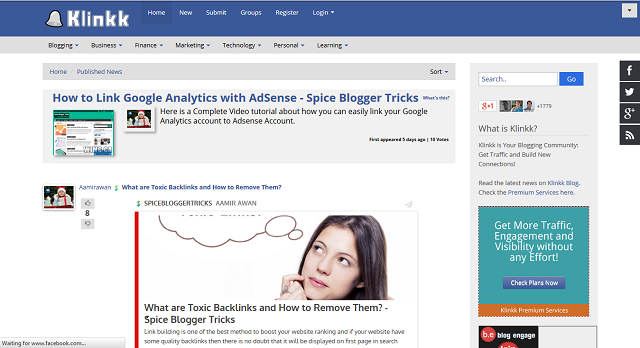 It is very active and seems already established social bookmarking site. Scoop.it mostly caters to the small business sector with tips and tweaks to succeed in online marketing. 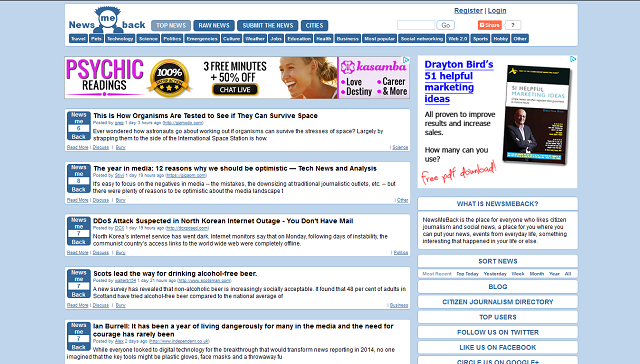 NewsMeBack ( http://newsmeback.com/ ) Yet another social bookmarking site, and this one is not limited to any topic and is maintained well. 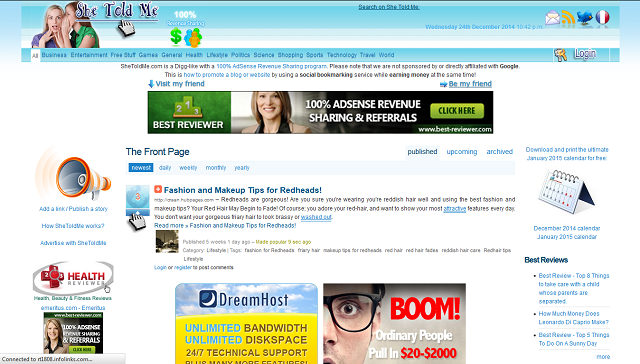 SheToldMe ( http://shetoldme.com/ ) is a very popular and established social bookmarking site. I haven’t been active on SheToldMe but I know this site had been around for years now. Inbound ( http://inbound.org/ ) @Inboundorg is a community that has its own authority in the marketing niche. 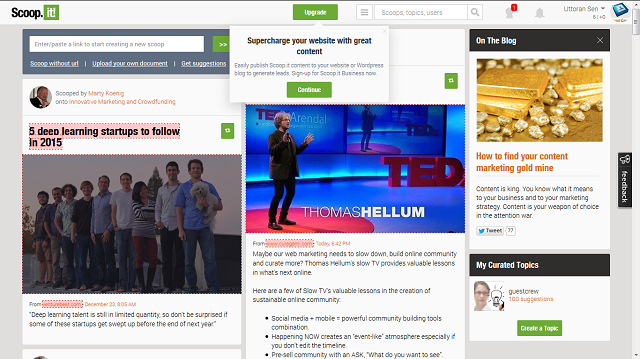 Inbound isn’t really a great place to promote yourself as self-promotion is something that they do not like. Follow their rules, put 95% of the focus into contributing rather than gain and you can find a place for yourself in their community. 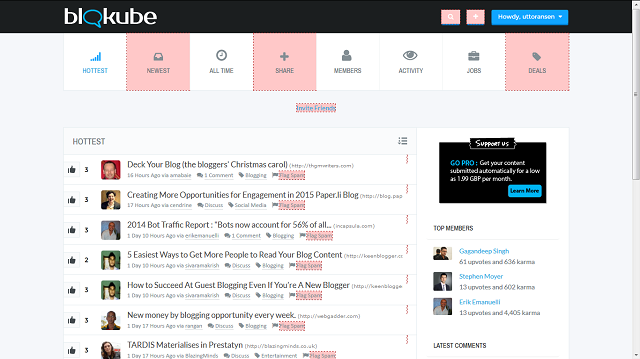 Dosplash is one of my favorite communities for bloggers. I wonder how I missed it in the first place. If you know about more such sites, please do mention them in the comments. Just make sure that they are active and well maintained. That’s a good list. And I am glas to see that you placed Kingged and Tsu as the top two, both networks I very much like. In fact, I like them all, except for the one surprise in there. I thought I knew them all, but She Told Me is new to me, so I will have to check it out. SheToldMe is an ancient site, I think I know the owner too but haven’t been much active there. For the 2015, I really want to make a strong profile on most of these sites. It is nice to meet you. This is my first visit to your blog. I am just amazed of how many things are out there to help us socialize with others. Some I have heard of, some I had no clue were around. I knew I was going to find something new on the list and that turned to be true. She Told Me is very new to me and I’ll surely be checking it right this moment. Kingged has lost its momentum I think. It’s not as popular as it used to be. I don’t see the VAs around any more and that has left the platform behind. Turns out SheToldMe is new for quite a few people! About Kingged, yes I see that the platform is not really as popular now as it was a few months back. Have they stopped paying users? I got too busy with GuestCrew myself I forgot to check much of Kingged lately. Thanks for such a great list. Some I’d already come across but a lot were new to me. I tried Kingged a while back but it was going through it’s “site very slow to load” phase. I understand that’s all fixed now. I liked the site except for the fact that (at the time, not sure if still) you were required to have something like “visiting from Kingged” on every comment – almost as if people wouldn’t want to come to your blog unless they had to. Perhaps that’s just me being iffy as I know it’s popular with manyu bloggers. Don’t know if it counts as a social network – I just know it’s a great place for bloggers to be! Kingged is pretty good on the loading now, they have worked hard on their site. Kingged was paying it’s users for making comments but the users were copy/pasting the same comments that they leave on kingged to the target blogs as well. So, I guess they had to enforce those rules. 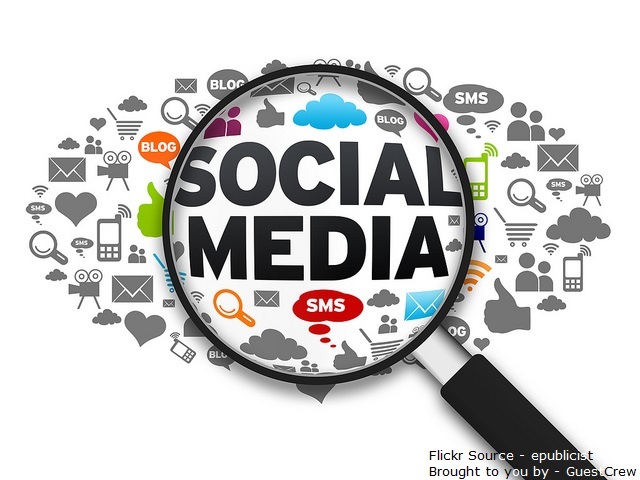 Your list of the social networks to promote business in 2015 is cool and refreshing. I am glad Kingged.com made this list and so are other popular social bookmarking sites. Like David stated, I am new to “She Told Me”. I may have to check it out, as well! 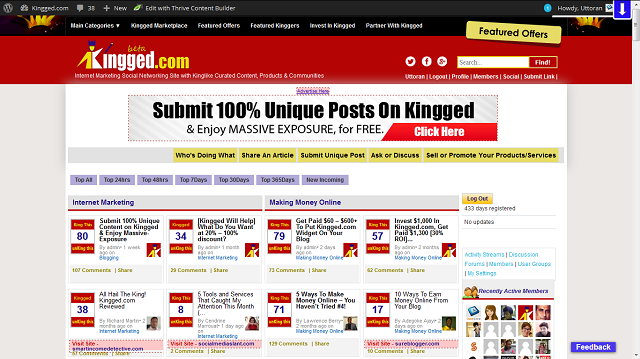 Surely Kingged is one of the very best social blogging networks around. Good to know that SheToldMe is new to you as well, strange how that happens sometimes as you all are pretty much experienced in the blogging niche and yet you find new communities. 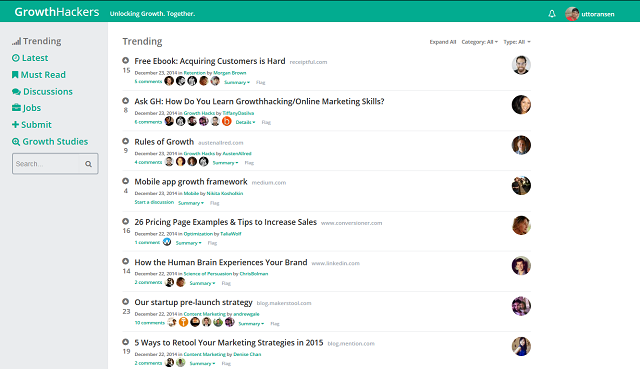 GrowthHacker is a new find for me a few weeks back, I was pretty excited myself when I found a new and established site on this niche. Many Thanks for fearless share, I’m already done to make my profile into the TSU, Kingged and many years I used to share my post Biz. Rally a brave article from you dear. Best of luck. This is a nice list of sites that we can go through. I heard of about half of these sites and use 4 of them. 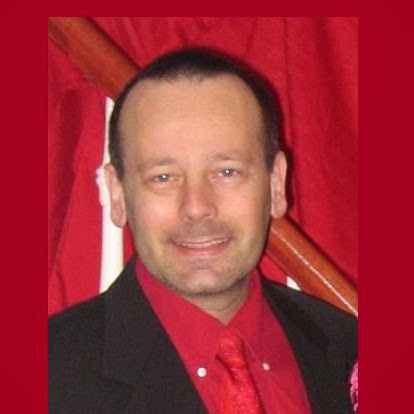 Right now Kingged.com is my top site, but it’s good to know about other sites that you can spread content as well as yourself around. Thanks for sharing Uttoran! Have a great week! Good to know that you found some new sites. 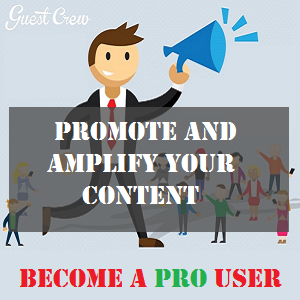 Do use the rest of them to promote your content, they are all great in promoting content. What Would a TopTen List Look Like? Why is there a global-warming controversy at all? Is it supposed to be a scientific fact or a religious opinion? Why do teachers teach what they want? Will western civilization rise or fall on it’s own beliefs? Communications Needs a new Best Practices: What Would a Top Ten List Look Like? Here’s the deal: science communication can be a tricky business. It can be defined in a variety of ways, and includes different interests with different/competing goals. But while the goals may differ, the challenges are the same: How do we reach people? great list of places where to find people to network and connect with. It’s a big pleasure to see “Klinkk” in your post. This list is so helpful and new to me. In fact, I am just using Scoopit to promote my online business. Others networks are new to me. So, thanks to your post, I have many ideas for my business. Really thank you for this list. Good job! Glad to know that you liked the list, yes – there’s plenty of places to promote our business and content.